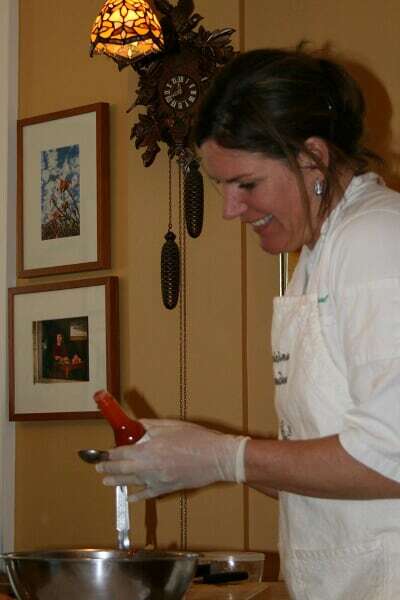 Enunciating clearly and chuckling frequently throughout her lively cooking demonstra­tion, Bartels was the first chef on Helena’s 20th annual Artbeats Chefs Tour, a recent fundraiser benefitting the Grandstreet The­atre, the Helena Symphony and the Holter Museum. Even her mannerisms were Julia-esque, as she entertained the overflowing crowd. 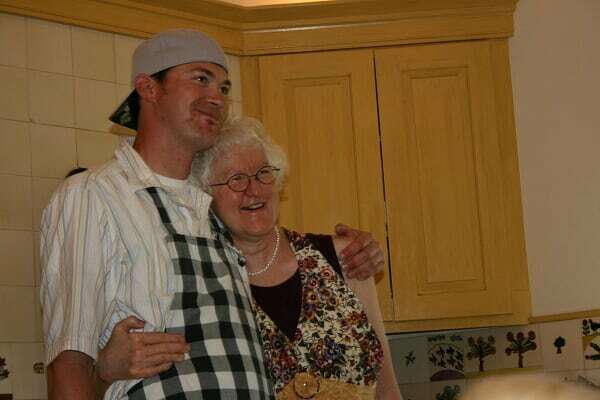 “The more the merrier!” she exclaimed before introducing the onlookers to her son Mark, her sous-chef. Bartels demonstrated making Tarte aux Myrtilles, a French blueberry tart. “It’s appealing because it’s fast and it’s easy,” she said, adeptly assembling the tart dough and rolling it out, folding it in quar­ters and laying it in the tart pan. From there, it was merely a quick pulse of the food processor before she poured the almond mixture atop the crust, adding the blueberries. And voila, the tart was done, ready to bake and take almost anywhere, a perfect go-to dessert for spring and sum­mer. Bartels also whipped up Red Pepper and Artichoke Bruschet­ta, Italian Meatballs Stuffed with Italian Sausage and Pepperoni and Gruyere Potatoes, present­ing all four delicious dishes with­in the hour. Welcoming the crowd at house No. 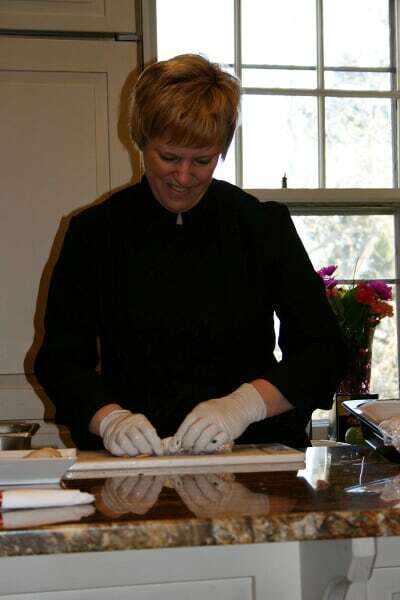 2 on the tour was Marci Andersen, owner and executive chef at Marci’s Catering in Hele­na. Calm and collected, she was cooking casually in the kitchen in her black chef’s coat when the group arrived. Andersen’s instruction flowed from recipe to recipe seamlessly. “I wanted to prepare recipes that I loved,” she said. The recipes demonstrated dur­ing the chefs tour were dishes anyone could prepare with a small list of ingredients, she said. Starting with her Asian noodle rolls, Andersen demonstrated how to soften the rice paper wraps in water and then fill them with English cucumber, carrot, apple, mint, cilantro, rice noodles and canned French-fried onions. She carefully rolled them up bur­rito- style, sliced them for sam­pling and drizzled with her jazzed-up Hoisin sauce. After that there’s no right or wrong, she said, it just depends on your taste. Inspired by May and Cinco de Mayo, the third chef, Sandee Car­dinal, developed a menu sporting a southwestern flair. She owns and operates Earth to Table Chef’s Services in Wolf Creek. Cardinal created her business in 2000, inspired by her soon-to-be­ husband’s massive garden. Cardinal uses their garden pro­duce whenever possible, from asparagus to zucchini. She has a culinary degree from Johnson and Wales and spent several years working in restaurants, hotels and resorts before becom­ing a private chef in 1997. Her job is never dull. She also conducts cooking classes in people’s homes and creates gourmet lunches for her outfitter husband Pete and his clients. Cardinal started with her Shrimp Ceviche Salsa, her most requested recipe. She explained that it’s not a true ceviche, which refers to raw shrimp or fish mari­nated in lime or lemon juice, because her preparation involves steaming the shrimp. The beauty of this recipe is that it’s fresh, crunchy and delicious, especially well-suited for spring and sum­mer, she said. Cardinal said while it involves a lot of chopping and might seem labor-intensive, it’s worth it. Following the chefs tour, cook­book writer and editor Ellen Boeke gave a talk peppered with Julia Child quotes about her career in the world of food writ­ing and gave a behind-the-scenes look at how a cookbook is put together. “No matter what happens in the kitchen, never apologize” was the first of several tidbits of wis­dom by Child that Boeke used to flavor her presentation. “I’m not a headliner when it comes to cookbook writing, just one of the many, many folks who work hard to make sure the recipes that people try work, taste good and are easy to follow,” Boeke said. She has worked on cookbooks for notable food personalities such as the Deen brothers, San­dra Lee and Chef G. Garvin. Her latest project is the 15th edition of “Better Homes and Gardens’ The New Cookbook,” better known as “Red Plaid,” which will be out in stores in October. Boeke completed the Basic Cuisine Course at Le Cordon Bleu in Paris after studying food sci­ence and journalism in college. Her recipe for success in the kitchen begins with remembering that we eat with our eyes so food has to look good to taste good. Susan Bartels made blueberry tarts. The original recipe came from “Chez Nous: Home Cooking From the South of France” by Lydie Marshall. Combine ingredients for tart shell. Chill for 15 minutes. Roll out. Combine the almonds, sugar and flour in a food processor or blender. Process until the almonds are finely ground. Sprinkle the almond mixture into the tart shell. Cover with the blueberries, and sprinkle some sugar over the berries. Bake at 425° for 30 minutes. Check to make sure the tart shell is browned by peeking at it. It works best to place the shell on the bottom rack of the oven. Sprinkle with powdered sugar and serve with sweetened sour cream. Hi there, I found your site via Google even as searching for a similar subject, your website came up, it seems to be great. I have bookmarked it in my google bookmarks.